There’s currently a pause with the Pickersgill (which is actually a 113 Class as opposed to a 72 Class – more on this later) as I wait for an appropriate gearbox. Clearances inside the old clunker mean I have to use a smaller motor with a 1.5 mm shaft rather than the type I had intended. 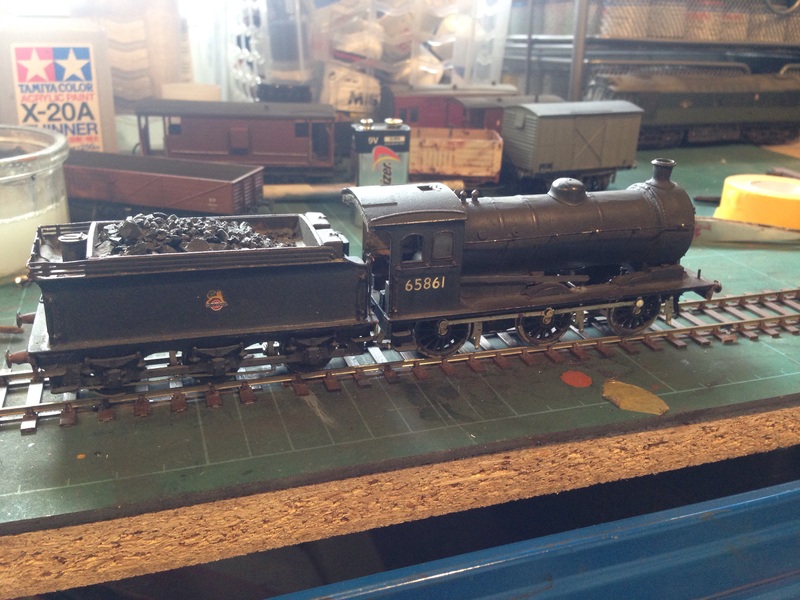 Whilst I wait then I have decided to crack on with another stalled job, an ex – North Eastern J27 0-6-0 which I had been soft-pedalling through the winter. The model had a few problems which I gradually worked through today. Due to clearances (again!) it was only possible to attach wiper pick-ups to the leading two driving wheels. 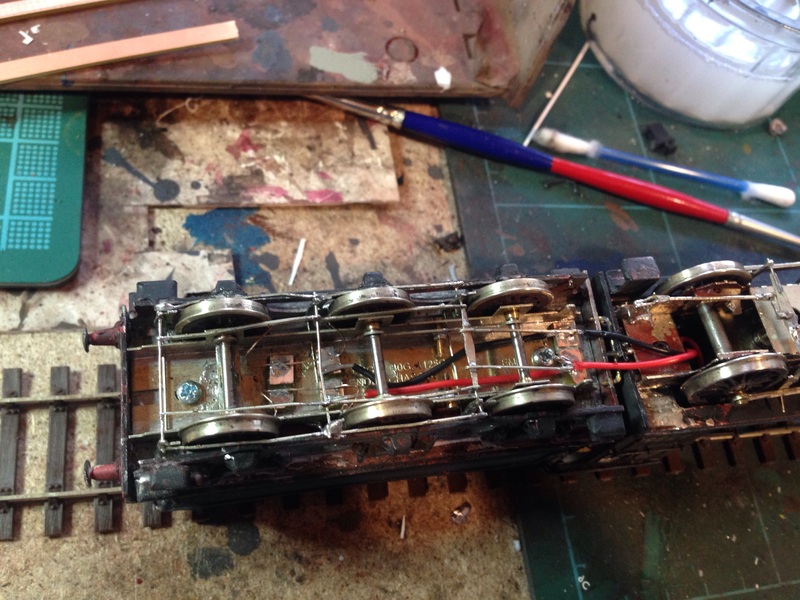 I also changed these from nickel silver to phosphor-bronze after some assistance from fellow Scalefour member, David Thorpe who provided some PB wire. I elected to compensate for the loss of puck-up on the rear pIr of drivers by creating pick up on the outer four wheels of the tender which is now permanently connected. I think I managed a pretty neat arrangement for the tender which I show quite unashamedly below. Fine tuning and a proper test run are really needed, but the arrangement has worked and I can now think about starting to make the rejuvenated model look good. I like this new word “puck-up”. Has it not been for the fact that you successfully installed your pick-ups, I’d have thought that it could mean making a complete mess of a pick-up installation…. Anyway, I now always try to fit pick-ups on the tender wheels but have sometimes found it difficult to ensure that the wheels still run freely afterwards. Did you use the thinner wire? In this case I used the heavier gauge wire, David. Since she’s a heavy cast model designed for the heavier end of freight work I figured it was justified. There is evidence of a little drag on the tender axles but I’m going to subject the loco to some running in before I even think about altering the pick ups any at this point. Still, I’m sure you can see from the state of the brake rigging on that tender that perhaps ‘puck-ups’ wasn’t so wide of the mark after all. Hi Dave, you’re certainly whizzing along with the projects, so what is your secret to this increased Mojo???? And can I get some in Boots. I think it’s basically down to the first proper break and wind down I’ve had in several years and especially since I ‘retired’ from Les Gendarmes! I’ve got the time and the motivation again so I’m just getting steamed in. Might be another week or two before I’m fit enough for the DIY, heavy gardening so I’m making as good a use of the time as I can!